Indian Tigers pull out a thrilling victory on the Perth wicket. Yes, you read it right, on Perth. Before the start of the match everyone was of the opinion that the pitch won't crumble but the Indian batting might. Also, after the Sydney fiasco that seemed a logical outcome. However, Indian cricket team proved everyone wrong. 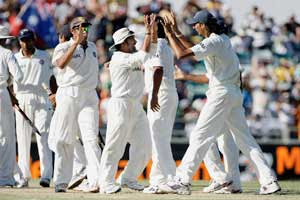 The victory march of the Australian cricket team was stalled once again by India. They were thinking of breaking their own record of 16 straight victories. However, India had some other plans. After the Sydney episode, I personally was looking forward for a strong fight back from India. Frankly I did not expect India to win or give such a strong reply. The arrogance of Ricky Ponting was outdone by Anil Kumble's patience and doggedness. Anil Kumble has emerged as a great leader. 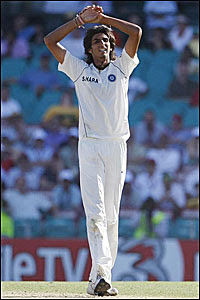 Ishant Sharma, the young lad bowled with a big heart. He took only one wicket but a very important one that of Ricky Ponting, the Australian captain. Irfan Pathan had sent the openers back in both innings. He too has made a great comeback. He is a champion allrounder in the making. Rudra Pratap Singh too bowled nicely. Virender Sehwag was the surprise package. 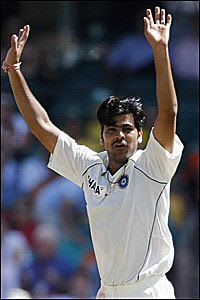 He took two wickets to pave way for India's victory. On the batting front too Virender Sehwag and Wasim Jaffer gave a good enough start. Then Rahul Dravid, Irfan Pathan, Mahendra Singh Dhoni, Sachin, VVS laxman and even R P Singh contributed to ensure India is in a comfortable position. This victory is a very special one. To win when no one expects you to even draw the test match itself is a big achievement. Anil Kumble's 600th test wicket could not have come at a better occasion. All in all a very good test victory for India. After all winning test matches is not monkey business. First time ever in the history of Test cricket Indian Eleven lost to Australian Thirteen. Yes, for the first time Australians played with thirteen players instead of the normal 11. 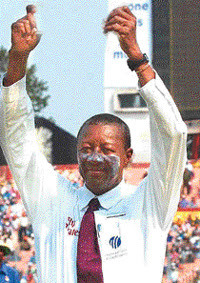 The two umpires Mark Benson and Steve Bucknor were playing for Australia. Steve Bucknor taking the lead in getting the Indian players out. According to me Steve Bucknor is the Man of the match at Sydney. Atleast eight decisions went against India at the Sydney test. From day one of the Sydney Test the umpires were playing for Australia. Not only the two on field umpires but even the third umpire. The fourth and fifth day were the most dramatic. 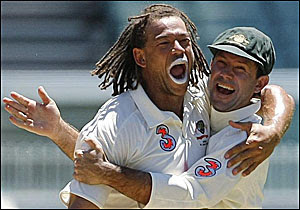 Harbhajan was accused of being racist towards Symonds on fourth day of the test. Atleast on this occassion both the umpires did not hear Harbhajan passing any racist comments. But at the end of fifth days play Harbhajan gets banned for 3 test matches. This seems to be a definite ploy to keep Harbhajan out of remaining tests because he was consistently getting the Australian captain out. Ricky Ponting had become Harbhajan's bunny. They didn't have answers to his bowling and hence they planned to get him involved in a verbal duel so as to create a case against him. Even though there was no evidence against Harbhajan to prove that he indulged in racial slur, he faces the ban. On fifth day both Rahul Dravid and Saurav Ganguly are given out when actually they are not out. Steve Bucknor ruled Rahul Dravid caught behind when it was very clear that the ball just brushed the pads and was no where close to the edge of the bat. Ganguly's wicket was the most dreadful one. Ganguly nicked a ball to the slips and Michael Clarke did not catch it cleanly. Umpire Mark Benson was not sure and he chose to confirm the catch with Ricky Ponting (opposition captain) instead of the third umpire. Maybe from third test onwards Indian appeal should be targetted to Ricky Ponting and not the on field umpires. I am not at all impressed with the BCCI. The country's pride is at stake and the BCCI has not been vocal enough against all the cheating that has been meted out to the Indian players. Cheaters have the last laugh.